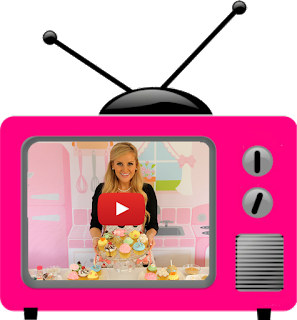 In this Baking 101 Video, we start with the basics, as I show you some tricks for how to measure semi-solid ingredients, like butter shortening, peanut butter or margarine! 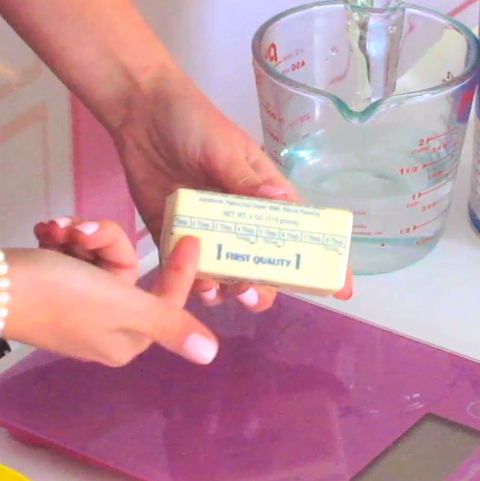 Liquid fat, such as oil or liquid margarine, should be measured using a liquid measuring cup or measuring spoons. Solid fats, such as butter, margarine or shortening in the form of a stick, can either be weighed or sliced according to the pre-measured marks on the sides of the wrapping (I always weigh out large amounts even after slicing according to the marks on the wrapper, for accuracy). Solid fats, such as margarine, lard, buttery spread, or shortening packaged in a tub (and non-liquid, wet ingredients such as sour cream, yogurt, apple sauce, mashed banana, peanut butter, etc.) 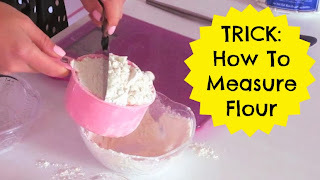 can be measured by pressing the ingredient into a measuring cup, lined with saran wrap for easy removal, level it off against the top of the measuring cup and lift it out by the saran wrap. You can also measure solid fats with the liquid displacement method; ex: If you need 1/4 cup shortening, fill a liquid measuring cup with 1/4 cup water, add enough shortening until the water level reaches the 1/2 cup mark. Since 1/4 cup + 1/4 cup = 1/2 cup, you know that your measuring cup now contains your desired 1/4 cup shortening. You can then pour out the water and use your shortening as directed in your recipe. Oil typically yields a more dense, heavy, yet moist baked good. Shortening or lard yield the most tender or flaky and moist baked good. Butter is somewhere in the middle with a nice tenderness, while margarine yields the least amount of tender, moist, flakiness in your baked goods. vegetable shortening, vegetable oil and lard adding virtually no flavor to your baked good. Margarine usually comes in tubs or sticks. It is an oil based spread made of vegetable fat and water and typically contains salt. I do not recommend baking with margarine as it will not lend the same quality and taste that you get from butter. 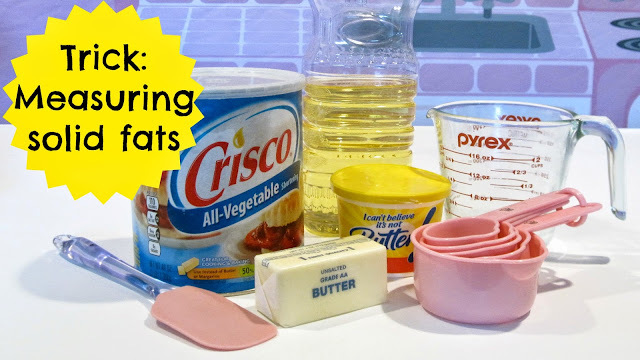 Vegetable shortening (or "Crisco" as labeled in the grocery store) is a solid fat made from vegetable oils, such as soybean and cotton seed oil. It is virtually flavorless but also comes in butter flavored variety. Shortening is ideal for making pie crusts or pastry, since it blends well with flour or a stiff buttercream frosting since it has a high melting point and remains more solidified at room temperature, however I recommend using at least half butter, half shortening in an all shortening recipe to maintain a nice flavor. Vegetable oil is the most common oil used in baking. Some recipes call for olive oil, but it is not recommended in baking unless called for because it lends a stronger flavor to your baked good than a typical mild oil with a neutral taste. Some common, neutral tasting, all-purpose oils that are good for baking are: vegetable oil or canola oil (most commonly used), corn oil, safflower or sunflower oil. Vegetable oil also come in non-stick spray cans that are great for spraying the pan. You can alternatively fill a non-aerosol spray bottle with oil of your choice to coat pans, for an simple, affordable, refillable option. Butter: Unsalted butter is usually called for when not specifically stated but salted butter can be used in its place by reducing the amount of salt in the recipe by 1 teaspoon per pound of butter. I do not recommend substituting oil for butter or using low-fat spreads, margarine or light butter for baking. Oil: Substitute half of the oil in the recipe for unsweetened applesauce to cut the fat for a healthier alternative. For example, if the recipe calls for 1/4 cup oil, use 2 tablespoons oil and 2 tablespoons applesauce. Note this may change the texture of your baked goods, and make them more dense and chewy. 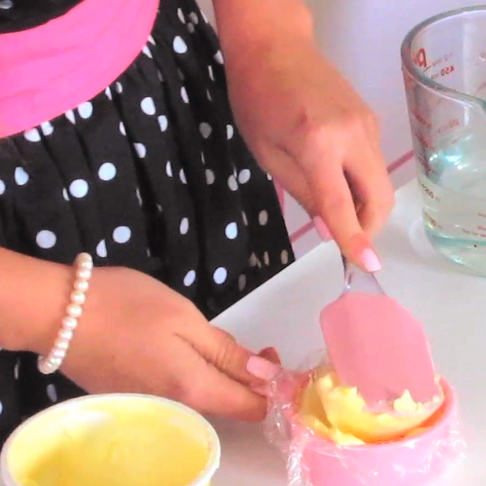 Liquid fat, such as oil or liquid margarine, should be measured using a liquid measuring cup or measuring spoons. Solid fats, such as butter, margarine or shortening in the form of a stick, can either be weighed or sliced according to the pre-measured marks on the sides of the wrapping (I always weigh out large amounts even after slicing according to the marks on the wrapper, for accuracy). 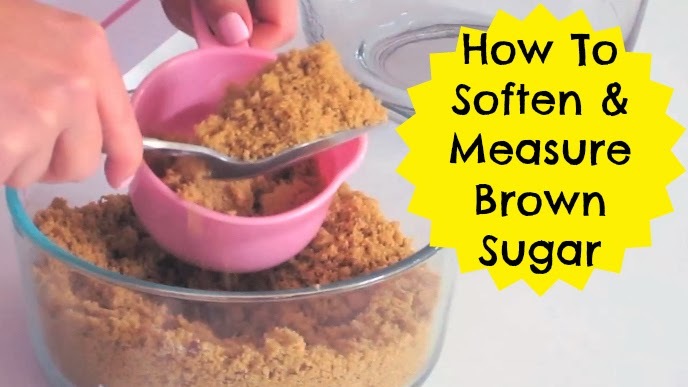 Solid fats, such as margarine, lard, buttery spread, or shortening packaged in a tub are measured by scooping the ingredient into the measuring cup/spoon and then leveling off. You can also measure solid fats with the liquid displacement method; ex: If you need 1/4 cup shortening, fill a liquid measuring cup with 1/4 cup water, add enough shortening until the water level reaches the 1/2 cup mark. Since 1/4 cup + 1/4 cup = 1/2 cup, you know that your measuring cup now contains your desired 1/4 cup shortening. 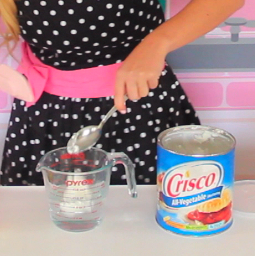 You can then pour out the water and use your shortening as directed in your recipe. 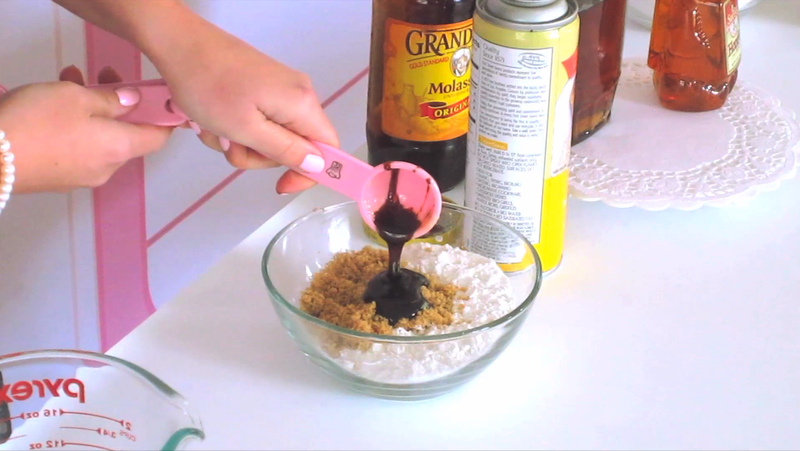 Non-Liquid, Wet Ingredients: Ingredients such as sour cream, yogurt, apple sauce, mashed banana, peanut butter, etc. should be measured using dry measuring cups and measuring spoons. Scoop ingredient into cup/spoon and level it off.